I grew up with a younger brother who was obsessed with World Wrestling Entertainment (or World Wrestling Federation (WWF) as it was known back then) and GLOW (Gorgeous Ladies of Wrestling). So it was no real surprise to me that my son at the same age would think wrestling was cool. Of course now you have John Cena who is infinitely better than Hulk Hogan and his ilk from the 1980’s. My son first encountered Mexican wrestling (aka Lucha Libre) at a Day of the Dead festival in London. 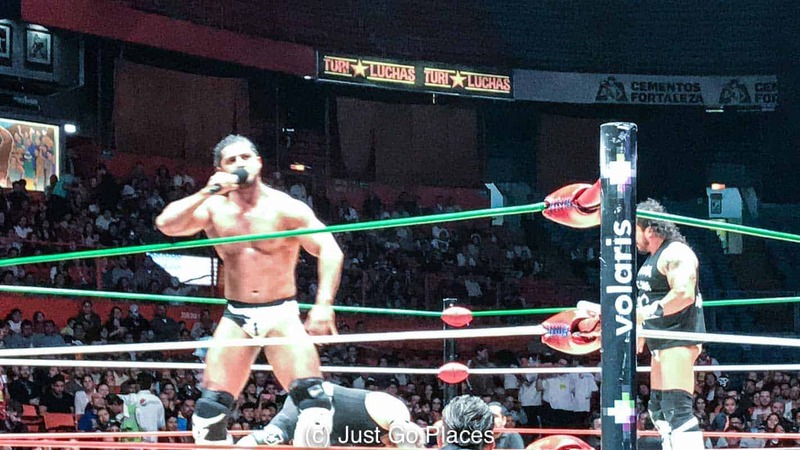 After that debut to Lucha Libre, he really wanted to watch Lucha Libre in Mexico City as well. With colorful masks, oversized personalities and crazy Mexican wrestler names, the whole event promised theatrics if not actually any sporting entertainment. My son got the obligatory mask that they were selling in front of the stadium. 1.1 First things first, what does lucha libra mean? 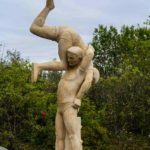 When the French tried their ill-fated intervention into Mexico in the mid-19th century, they brought with them French cuisine and Greco-Roman wrestling. The French left, but the food and the wrestling became their own Mexican versions. Several decades later, Mexican wrestling really came into its own with the advent of televised matches and the popularity of the first superstar of Lucha Libre, El Santo. It’s a colorful spectacle with more acrobatics than wrestling. First things first, what does lucha libra mean? The words ‘lucha libre’ is technically translated as a free fight. It’s a form of wrestling developed in Mexico where the wrestlers wear masks and inject theatricality and acrobatics into their style. I can truthfully say it’s like nothing you’ve seen. They seem to get away with more than even the WWE/WWF wrestlers. In Lucha Libre, El Santo is the grand daddy of wrestling. In 1942 he won a match against 8 men and became a folk hero. He was the common man fighting for justice that many people could identify with. He appeared in movies and comic books too. In Mexican wrestling, you have the goodies versus the baddies. It’s a clear-cut universe that people understand. I was told Lucha Libre is popular with the working classes. I can imagine it’s like the telenovelas that are so popular in Latin America. In a confusing world, a bit of melodrama and clear cut heroes and villains provided entertaining escapism. A luchador whips the crowd into a frenzy. When they get their family members involved in the sport, Mexican wrestlers create a mystique that lives past them. For example, El Hijo del Santo (the Son of the Saint) is also a luchador and wears a similar outfit to El Santo. There was a mini-family crises when one of El Santo’s grandchildren wanted to be El Niete del Santo (the Grandson of the Saint). El Hijo took El Niete to court and put a stop to that branding infringement presumably because he wants one of his own kids to have the title. Other famous Mexican wrestlers include Gory Guerrero who invented some of the famous wrestling moves you still see today. He took set up a dynasty and his relatives became Los Guerreros who took Mexican wrestling techniques to the USA and the WWE/WWF. You may have seen the 2006 Hollywood Lucha Libre movie, Nacho Libre starring Jack Black. Nacho: Chancho. When you are a man, sometimes you wear stretchy pants in your room. It’s for fun. It’s based on a real fighting priest, Sergio Gutierrez Benitez, who fought as Fray Tormenta (Friar Storm). Benitez was born to a poor family and became a druggie before he found salvation as a Catholic priest. In order to support his Catholic orphanage financially, he fought for 23 years as a luchador. You would think that Fray Tormenta couldn’t establish a dynasty, right? Wrong. It’s Mexican wrestling where the rules are flexible. One of Benitez’ orphans fights as Fray Tormenta, Jr.
There’s also Mexican midget wrestling. I kid you not. At one of the tag team matches we saw, some of the fighting combinations included wrestlers of small stature. Apparently having a normative size wrestler and his ‘mini’ buddy is a popular combination. Neither do all midget wrestlers have to be subject to dwarfism. You can just have a short guy. Midget wrestling is still popular in Mexico despite criticism. Political correctness has not reached Mexico. But, hey it’s a job in a country where 46% of the population lives in poverty. You also get luchadores who wrestle in drag – the so-called exoticos. They may or may not be gay but are definitely campy fun poking at traditional male social norms. We didn’t see any exoticos but we definitely saw lots of flouncing, hair pulling, hair tossing and face slapping. Lucha Libre costumes are intricate and are supposed to represent a wrestler’s persona. Mexican wrestling costumes include lots of assorted gear that get removed before the wrestler gets into the ring. 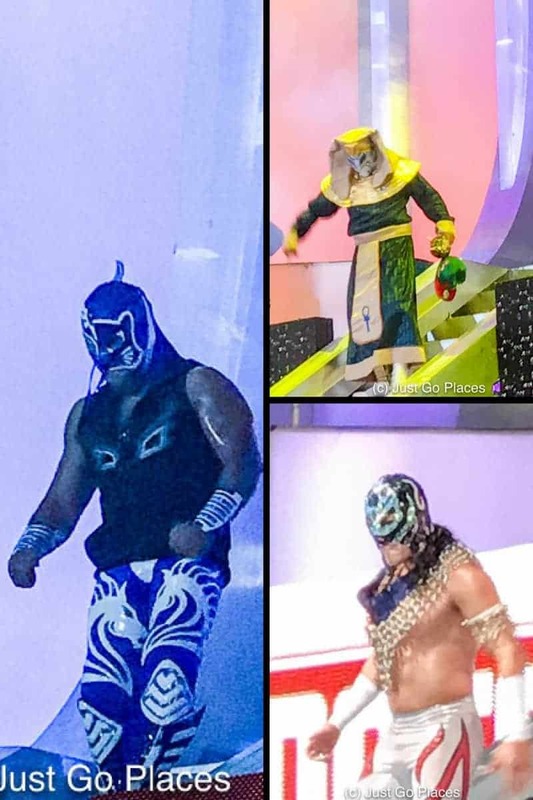 An assortment of Lucha Libre costumes. The only one I could make out was The Pharaoh. The basic luchador costume seems to be tight lycra pants. with or without a mask. Luchador masks are not compulsory. For example, Gory Guerrero didnt wear one. It’s those flexible rules, again. Mexico has a long history of using ceremonial masks going back to pre-colonial times. The Luchadores masks are fantastic representations of animals, mythical beings, and other larger than life characters. 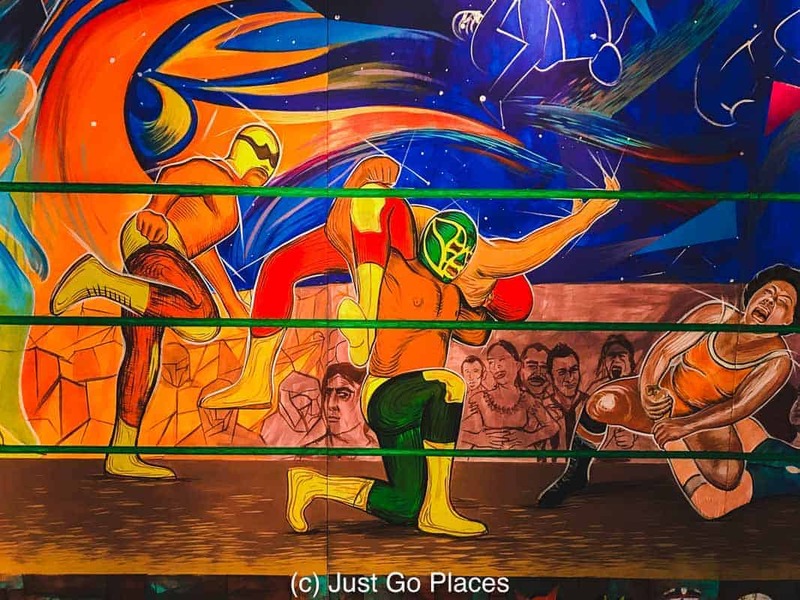 In Mexico City Lucha Libre is a sport widely attended by the whole family. The woman who sat behind us was holding an infant while her toddler sons were cheering away with her husband. Next to us, there was a young couple on a date. 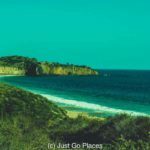 Everyone was perfectly nice – guzzling beer, chomping on popcorn or Mexican sweets and cheering at the top of their lungs. Lots of greased hard bodies in skimpy outfits. And that’s just the men. There are two arenas in Mexico City that have Lucha Libre matches – the Arena Mexico and the Arena Coliseo. The Lucha Libre Mexico City schedule is varied. Check online because they have events on set days. You can buy your tickets ahead of time on the internet or you can rock up and buy them at the event. Tickets are not particularly expensive so you should spring for good seats. There are three tiers – you should try and get into the bottom tier which are closest to the ring. 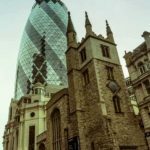 You can also get tickets through a tour company such as TuriLuchas. These tickets though include beer and tequila and are not available for people under 18 years old. We saw the TuriLuchas bus pull up outside the Arena and everyone get off. 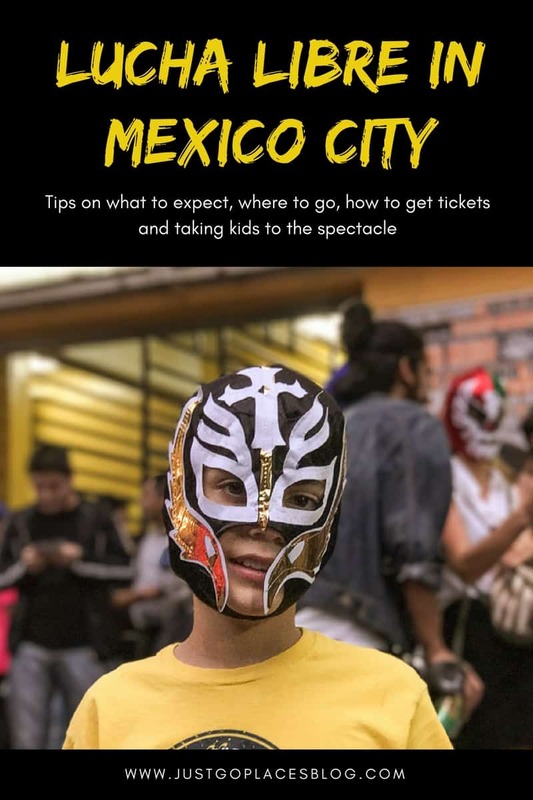 Get your Lucha Libre tour tickets here through Get Your Guide. Having said that there are tours available, we did not find that many tourists in the audience. Most people attending the Lucha Libre seemed to be locals. We had good seats in the floor arena near the stage where performers appear. I thought we would be far away from any mayhem. I was wrong. At one point the wrestlers started fighting as they were leaving the stage and spilled into our row. My son freaked out but the Mexican audience loved it. We didn’t see any arena girls wrestling but we did see them gyrate a fair bit. Every match required a costume change into matching bikinis that left little to the imagination. 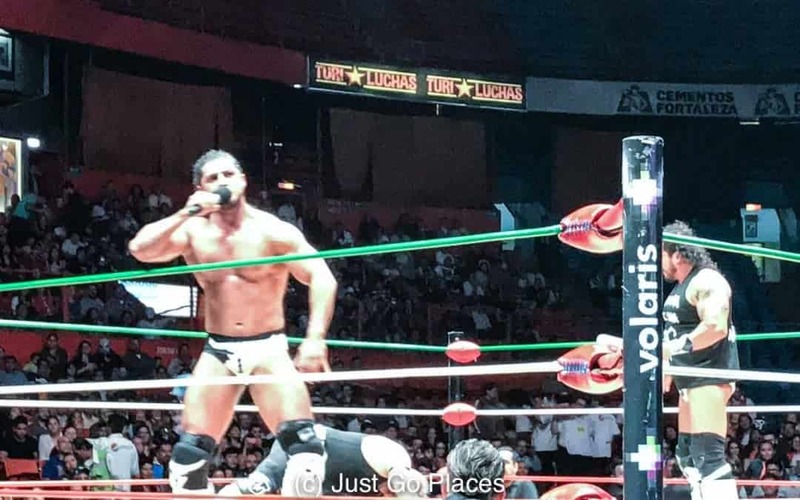 Mexico City wrestling also has slot at noon on Sundays which is promoted as a family-friendly show. Neither arena is in a particularly good area of Mexico City. Our hotel arranged for us to have a taxi to drop us off and to pick us up. 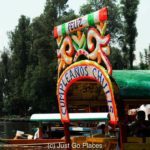 You can also arrange for an Uber which are popular in Mexico City. You are NOT allowed to bring in cameras into the venue. You can, however, bring your mobile phone. 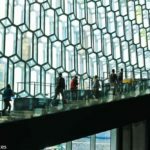 There is a security check where you can leave your camera which is what I did. Be warned though that action can spill out from the wrestling ring into nearby seats. Do not expect a quiet scene. There are horns blaring and people yelling throughout the event. We stayed at Hotel Villa Condesa in the cool neighbourhood of Condesa in Mexico City. This boutique hotel was great and had excellent service, food and facilities. The Villa Condesa arranged for our taxi and tickets to the Lucha Libre match at the Arena Mexico. Although the arena is only a couple of neighbourhoods away from Condesa, the vibe is completely different. The next time I’m in Mexico City. I want to check this out for sure. I had no clue about the history of the sport. It is so much fun! I’m sure you’ll enjoy it. 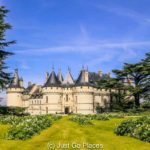 Ive wanted to do this for so long – and am going next week! Thanks for the information .. I feel I am better prepared now! And so excited for something so Mexican! This is so cool. 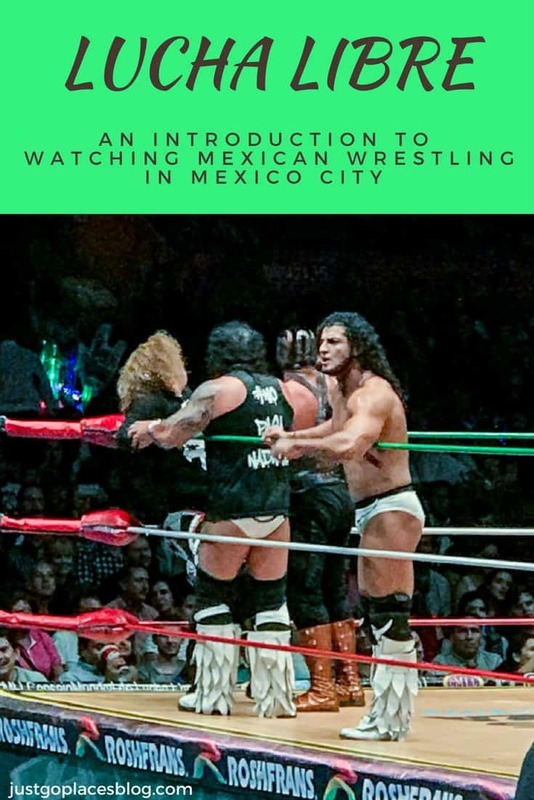 Even for folks who don’t have an ounce of interest in ‘professional wrestling’, this has to be a must see for everyone visiting Mexico city. The atmosphere was electric and I have to agree that I have zero interest in wrestling generally. The crowds are big2 ful but the arena was only about half full. Most of the spectators seemed to be locals – lots of families out en masse. Everyone really gets into their favourites and are very vocal in their spupport!